Today’s technology for students in the classroom is about more than getting them ahead in the workplace. In order to make it that far, students need to feel empowered, confident, and successful in their academic career. Without those components in place, many students feel inadequate and quit their academic pursuits altogether. 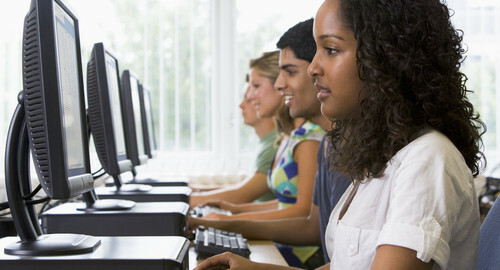 Teachers and administrators can use technology for students to foster a supportive learning environment for students. Know Your Student Population. According to Community College Week, almost seven million students are enrolled in a community college, yet only 12% of younger students will earn their Associates degree by age 26. Only 14% of low-income students will complete their degrees at all. Second Language Learner populations increase annually. These at-risk students need more help than traditional students in order to successfully complete their education. Use Assessments Wisely. One of the first methods for making students feel successful is to ensure they are placed appropriately depending on their knowledge/skill levels. Once they are in class, regular and strategic assessments ensure teachers and faculty have instant access to student performance. Those students who are not making the mark can be buoyed up with additional learning support and materials. Providing Online Classes. Today’s students are balancing school, work, and families, which means they need classes that are accessible from anywhere and during non-traditional school hours. The more online courses colleges and universities offer, the more efficiently students can learn the technological skills they need. For more information on improving technology for students in your classrooms, contact Labyrinth Learning.